Zane Benefits, which provides businesses with web-based health reimbursement arrangements, announced today the publication of a free eBook “State by State Guide to Health Insurance Marketplaces”. The eBook will help individuals, employers and insurance professionals understand the public health insurance marketplaces and prepare for 2014. Starting in 2014, health insurance coverage for individuals and small businesses will become available through new state health insurance marketplaces (also known as health insurance exchanges). Most importantly, the key tax credits (e.g. the small business healthcare tax credits) and tax subsidies (e.g. individual health insurance tax subsidies) will only be available for coverage purchased through a state health insurance marketplace. 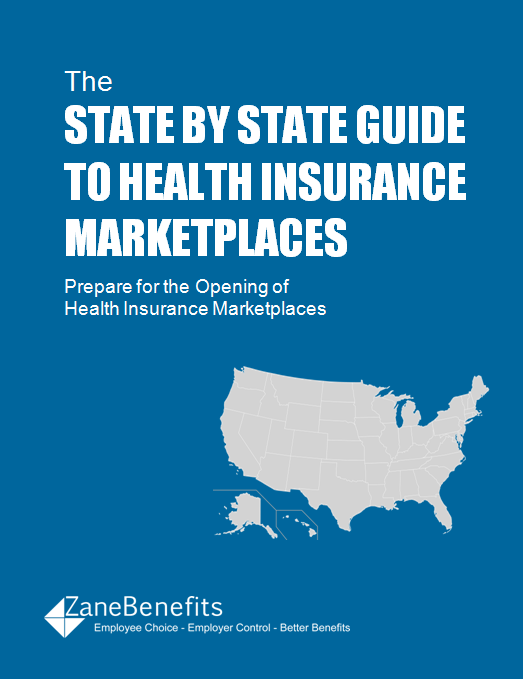 This guide outlines how each state plans to offer health insurance marketplaces. Individuals, employers, insurance professionals and CPAs should use this guide to prepare for the new public health insurance marketplaces opening in October 2013 (for coverage starting in 2014). What are the new health insurance marketplaces? What is the Small Business Health Options "SHOP" marketplace?